The Robert C. Shields American Series is an annual event which shares, with our regional audience, the rich art history and culture of our nation. Represented in these exhibitions are many of the key artists and artistic movements responsible for creating an American art legacy. This will be the 9th year we have offered this series and it continues to gain momentum and respect in the community for the rich visual perspectives it offers on American art. This exhibition features 60 fine art prints produced by more than 30 artists who worked within the printmaking programs of the Federal Arts Project of the Works Projects Administration. The prints are part of the personal collection of John A. Stewart, the founder and director of the Amity Arts Foundation of Woodbridge, CT. They are but a tiny fraction of his collection of American prints from the first half of the twentieth century. WPA prints offer examples of both the methods and philosophies of hand produced populist prints that visually communicate important messages for both the artist and the observer. Some of the artists in this exhibit are reasonably well-known, others much less so and others are known only by the existence of prints they produced while working in the WPA. The Amity Art Foundation Inc. is a nonprofit corporation created to promote, perpetuate and preserve the arts with an emphasis on traditional graphic art techniques. The Foundation’s emphasis is twenty first century printmaking and supporting, encouraging, and promoting student and emerging artists that produce art that is consistent with the methods and philosophies of traditional printmaking. The Foundation sponsors portfolio exchanges, exhibitions, juried shows, fine art collections, educational programs, catalogue raisonnes and other such activities in an effort to increase awareness of and partici­pation in the arts. The Foundation participates in printmaking conferences and exhibitions across the country. The Great Depression beginning was marked by the U.S. stock market crash of October 29, 1929. Lasting until this country’s entrance into World War II it was a period of economic and industrial collapse severely impacting all sectors of the American people. Frank Delano Roosevelt was elected president in 1932. Twenty five percent of American workers were unem­ployed and others faced wage cuts of upwards of forty percent. “One third of the nation was ill-housed, ill-clad, and ill-nourished.” (FDR, inaugural address) He proposed and Congress enacted a New Deal economic program to revive the nation and to put people back to work. “Simple work” he argued gave people money “however, more important than the material gains will be the moral and spiritual value of such work.” (FDR, message to Congress). Through a series of programs the Works Progress Administration was created to put people back to work, not just busy work but work as closely related to the workers’ private sector jobs. Bridges were built. Dams con­structed. Public buildings such as post offices were modernized and decorated. Public parks were created and a Federal road system was conceived and implemented. In 1935 the WPA/Federal Arts Project was founded to put artists to work. Artists of all types were put on the public payroll to create art. Filmmakers made films. Poets created poetry. Writers wrote books and plays. Actors, dancers and directors held performances. Painters painted. Sculptors sculpted. And, yes, printmakers made prints. The FAP employed 5,000 artists, who created among other things an estimated 108,000 paintings, 18,000 sculptures, 2,500 public murals and 250,000 prints. The approximate cost of the FAP was $35 million dollars. In addition to providing work for artists the FAP set four goals: (1) employ artists, (2) educate art students, (3) expand art programs into rural areas and (4) conduct research into and record America’s cultural past. Beginning with a workshop in New York City, printmaking workshops were established around the country. To be eligible to participate, an artist had to be certified as needy and prove that he/she had formerly been an artist. There was no discrimination in the program. Men and women of all ethnic backgrounds, artistic styles and proficiency were accepted. Segregation, where practiced, however, continued. Artists were paid approxi­mately $2.00 a day. The FAP print programs were active from 1935 through 1943. 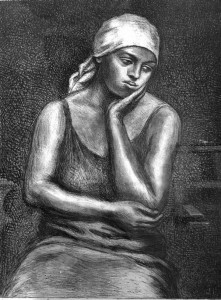 A printmaker would produce a proof, which would be approved by the workshop director before an edition was run, based on how popular the image might be. Few editions were as high as 75 and many if not a majority were under 25. All art with the exceptions of a proof or two retained by the artist were considered property of the Federal government and were to be used for public purposes; to decorate government offices and other public buildings. 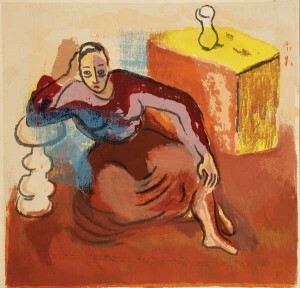 Although there was some level of artistic freedom, the subjects chosen for the artwork reflected the democratic ideal. Scenes from American life, both urban and rural, depict the common man at work and at play. Regional sensitivities were reflected in the workshops around the country. 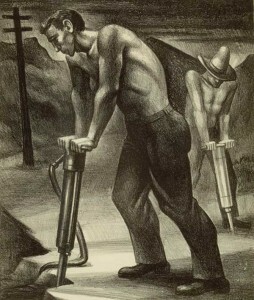 The works were populist and often emphasized the value of industry and hard work. Although most printing mediums were employed to produce prints, great technical progress was achieved within the workshops with color lithography, color woodcuts and serigraphy. The opportunities to develop these newer techniques in well-equipped public workshops enabled these mediums especially stone lithography to become more prominent. The skills learned in these workshops helped to change the course of printmaking in the twenti­eth century. The General Service Administration identifies 1,114 printmakers that produced prints during the program. An estimated 11,300 different images were produced. Some of the artists remained within the program for lengthy peri­ods of time. Other artists were in the program to produce a print or two only to drop out of the program. It can be anticipated that not all the artists who participated can be identified or that all the prints produced survived. Some of the artists became well known and had distinguished art careers following the FAP. Others were virtual unknowns at the time and details of their lives and work are lost. At the onset of World War II many of the artists were in the armed services, some as combat artists or illustrators, others as camouflage painters and others as regular combat GI’s. The art produced by the Graphic Arts Division of the FAP was not well preserved after the program ended. Some was inadvertently destroyed, some was lost and some used for scrap paper for public employees or in prisons. The General Services Administration still makes claims on private collectors that prints produced during the FAP period are government property. Contemporary printmakers owe a great debt to the printmakers of the WPA. 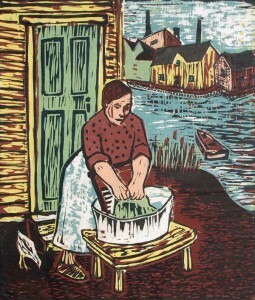 Not only were techniques developed that are widely used today but the foundations for the community of printmaking and printmakers was estab­lished. Printmakers came together to work together and to learn. Workshops were created that set an example of the collective and collaborative art production that are reflected in the academic print departments and the print workshops that exist today. The exhibition WPA GRAPHIC WORKS from the Amity Art Foundation Collection was curated by John A. Stewart, Director, Amity Art Foundation, Woodbridge, CT. The museum tour is managed by Landau Traveling Exhibitions of Los Angeles, CA. The South Bend Museum of Art’s 2015-2016 Exhibition Program is made possible, in part, with support from the Community Foundation of St. Joseph County’s ArtsEverywhere Initiative.